Cyanotype grid by Caitlin Webb-Ellis. 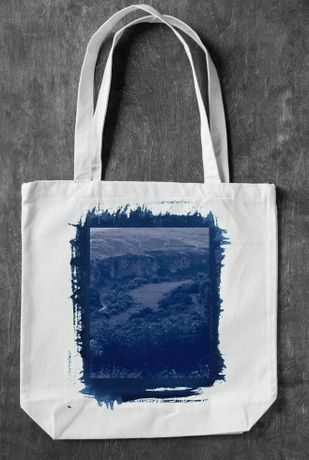 Tote bag with Cyanotype design, courtesy of Webb-Ellis. 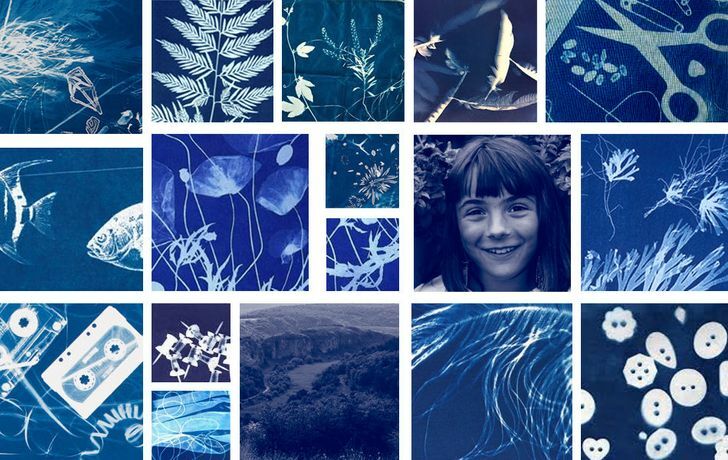 Artist duo Webb-Ellis will lead this hands-on cyanotype workshop where you will learn about the process, and create your own deep blue cyanotype prints on paper and fabric. We will look at examples of cyanotype printing, and consider the great range of possible ways to work with cyanotype. The workshop will cover the whole process, from creating a digital collage in Photoshop, to mixing the chemicals, coating the paper or fabric, and exposing using both the sun and our professional UV exposure unit. Beginners are very welcome, as well as those who are already familiar with cyanotype. Each workshop participant will be given a pre-coated cotton bag and pre-coated paper to work with and take home at the end of the day. You are also welcome to bring along your own paper and fabric to be coated and exposed during the workshop. We recommend that you bring along interesting objects that can be placed on the coated surfaces to create interesting patterns and compositions, e.g feathers, leaves, flowers, jewellery, large format negatives or seaweed. We look forward to a fun day of experimentation. The cyanotype process dates back to the birth of photography and is a magical process to work with. If you have particular images you would like to print as a cyanotype, please bring high resolution images on a USB drive. We will teach you how to create a digital collage in Photoshop, and print a large format negative to print as a cyanotype. A light lunch and afternoon cake will be provided.